We have the capabilities to fulfill your requirements FAST and SAVE you money. Your Single Source for all Your Plastic Needs. 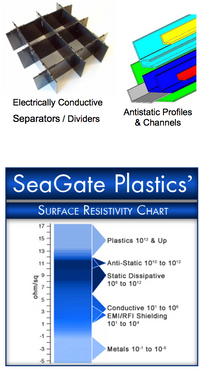 Contact Jay, he is your Anti-Static & Conductive Plastic Components Specialist. Call us today, 419-878-5010, to help you find the right solution for your Anti-Static & Conductive Plastic Needs. Need a fast quote on static control or conductive plastic components? Jay would be happy to help, call, for a hassle free quote. With over 25 years experience, Seagate Plastics is a trusted manufacturer of quality stock and custom profiles and tubing. With hundreds of plastic profiles and tubing to choose from, we may have your shape ready to ship with NO tooling costs. ESD, electrostatic discharge, is used incorrectly as a term for something that is "electrostatic discharge safe." The terms anti-static, conductive and dissipative are all terms that subdivide ESD into more detail. Something insulated is not considered ESD safe. Materials are divided into these terms based on their individual surface resistance. Surface resistance is a measurement of how easily an electric charge can travel across a medium. Conductive materials are materials that have a surface resistance of less than 1 X 105 ohms/square. Dissipative items have a surface resistance of more than 1 X 105 ohms/square but less than 1 X 1011 ohms/square. Anti-static materials are generally referred to as any material which inhibits triboelectric charging. This kind of charging is the buildup of an electric charge by the rubbing or contact with another material. An insulated material is one that has a surface resistance of greater than 1 X1012 ohms/square. A material that prevents or limits the flow of electrons across its surface or through its volume is called an insulator. Insulators have an extremely high electrical resistance, generally than 1 X1012 ohms/square and 1 X 1011 ohm-cm. A considerable amount of charge can be generated on the surface of an insulator. Because an insulated material does not readily allow the flow of electrons at the negatively charged spot might e sufficient to satisfy the absence of electrons at the positively charged spot. However, electrons cannot easily flow across the insulated material's surface and both charges may remain in place for a very long time. A conductive material, because it has low electrical resistance, allows electrons to flow easily across its surface or through its volume. Conductive materials have low electrical resistance, generally less than 1 X 105 ohms/square and 1 X 104 ohm-cm. When a conductive material becomes charged, the charge will be uniformly distributed across the surface of the material. If the charged conductive material makes contact with another conductive material, the electrons will transfer between the materials quite easily. If the second conductor is attached to an earth grounding point, the electrons will flow to ground and the excess charge on the conductor will be neutralized. Electrostatic charge can be created turboelectrically on conductors the same way it is created on insulators. As long as the conductor is isolated from other conductors or ground, the static charge will remain on the conductor. If the conductor is grounded the charge will easily go to ground. Or, if the charged conductor contacts or nears another conductor, the charge will flow between the two conductors. Static dissipative materials have an electrical resistance between insulated and conductive materials. There can be electron flow across or through the dissipative material, but it is controlled by the surface resistance or volume resistance of the material. As with the other two types of materials, charged can be generated turboelectrically on a static dissipative material. However, like the conductive material, the static dissipative material will allow the transfer of charge to ground or other conductive objects. the transfer of charge from a static dissipative material will generally take longer than from a conductive material of equivalent size. Charge transfers from static dissipative materials are significantly faster than from insulators and slower than from conductors. Static electricity is defined as an electrical charge caused by an imbalance of electrons on the surface of material. This imbalance of electrons produces an electric field that can be measured and that can influence other objects at a distance. Electrostatic discharge is defined as the transfer of charge between bodies at different electrical potentials. Electrostatic discharge can change the electrical characteristics of a semiconductor device, degrading or destroying it. Electrostatic discharge also may upset the normal operation of an electronic system, causing equipment malfunctions or failure. Another problem cause by static electricity occurs in clean rooms. Charged surfaces can attract and hold contaminants, making removal from the environment difficult. When attracted to the surface of a silicon wafer or a device's electrical circuitry, these particulates can cause random wafer defects and reduce product yields. Controlling electrostatic discharge begins with understanding how electrostatic charge occurs in the first place. Electrostatic charge is most commonly created by the contact and separation of two materials. While the magnitude of electrostatic charge may be different, static electricity is indeed generated.